So far, we have been having a lot of fun with Drawing with Children! I bought a sketch pad for each of us to use for our drawing lessons to increase the “specialness” factor with the kids. I’m also hoping that when we are done they will be pleased to have all their drawings kept nicely in a book and not end up in the recycle bin. The first step in the program is to determine your starting level. The girls were quite excited to find the dining room set up with scratch paper and all sizes and colours of markers after our daily quiet time. 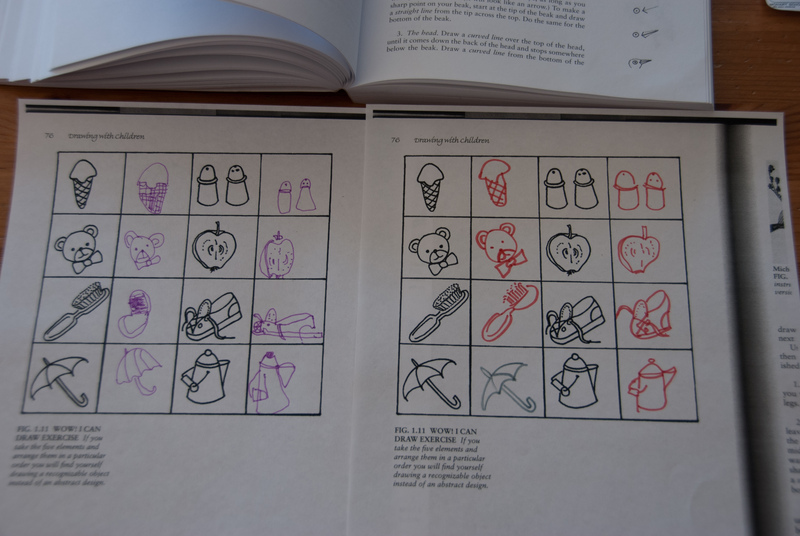 I had copies of the Level 1 & 2 exercises from page 44 for the three of us and we sat together to complete them. Little Sister (age 4) was able to duplicate with some reasonable ability just under half of the images. According to the guidelines, she isn’t ready to start the lessons yet and should start with some of the visual warm-ups and try the exercise again in a few weeks. She lost interest in our drawing lessons long before we got to any of the guided drawing exercises anyway. Big sister was able to duplicate all of the Level 1 exercises and almost all of the Level 2 exercises. I think I’ll have her repeat the Level 2 before we start our next lesson, as well as the Level 3 exercises. I then moved on to introducing the The 5 Basic Elements of Shape: The Dot Family, The Circle Family, The Straight Line Family, The Curved Line Family, and The Angle Line Family. 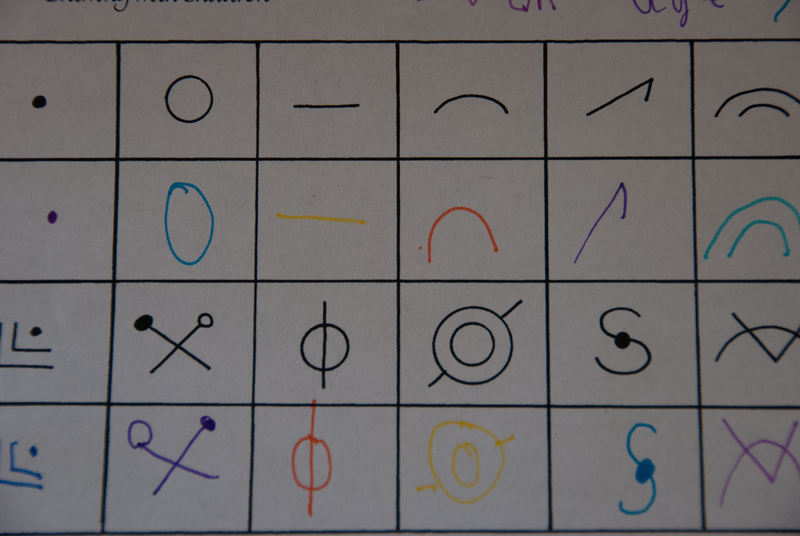 We practiced drawing these elements on our scratch paper with various colours. We observed our environment to find each of these elements in the room. Then we moved on to the mirror imaging warm-up from page 69. 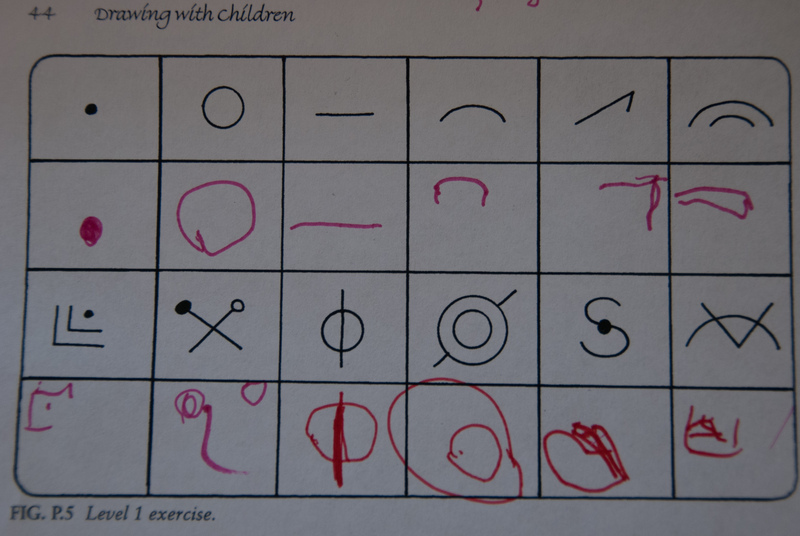 These were quite difficult as you can see – even for mama! 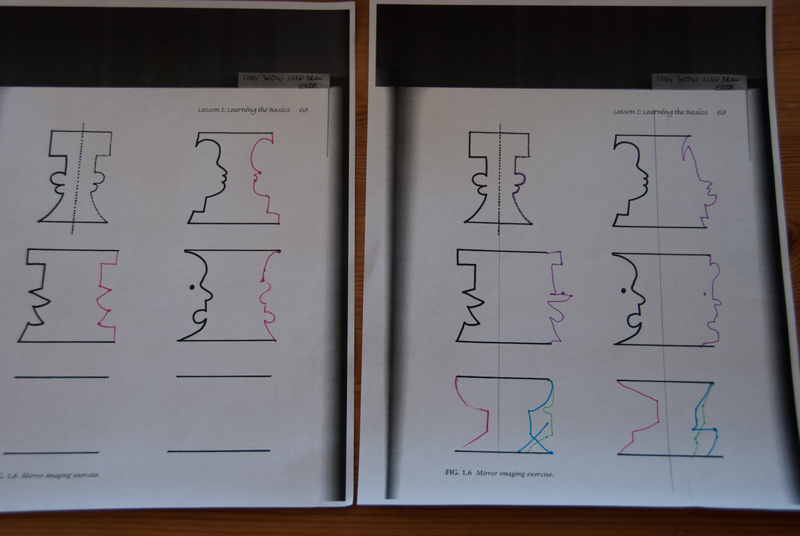 After we had completed our lessons, I did find full lesson plans for homeschoolers and printables from Donna Young which had some much easier mirror images. These were hard even for mama! Mine on the left and Big Sister’s on the right. Next we moved on to the abstract design warm up. By this time Little Sister was off building with blocks or playing dollhouse. Big Sister however, was loving every minute of this. 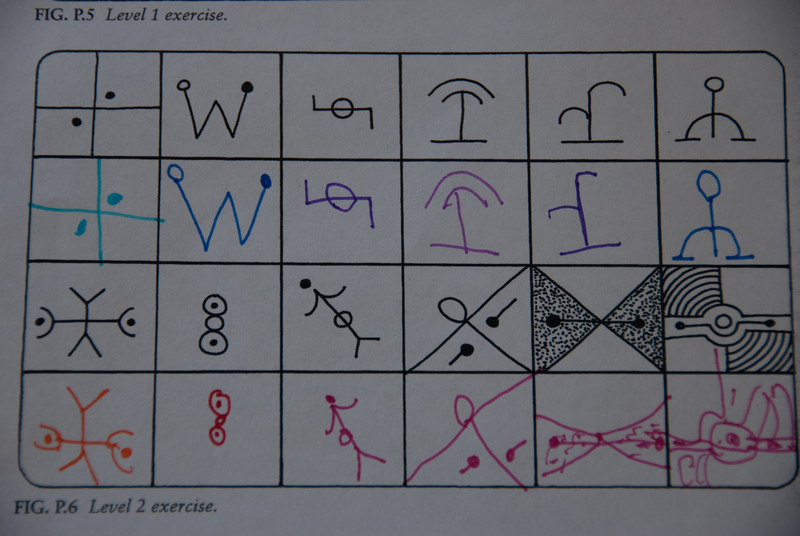 We did the Level 1 warm up and will probably do the Level 2 or 3 before starting our Lesson 2 project. The final exercise combines the 5 elements into recognizable objects. Big sister was quite surprised with what she was able to draw! 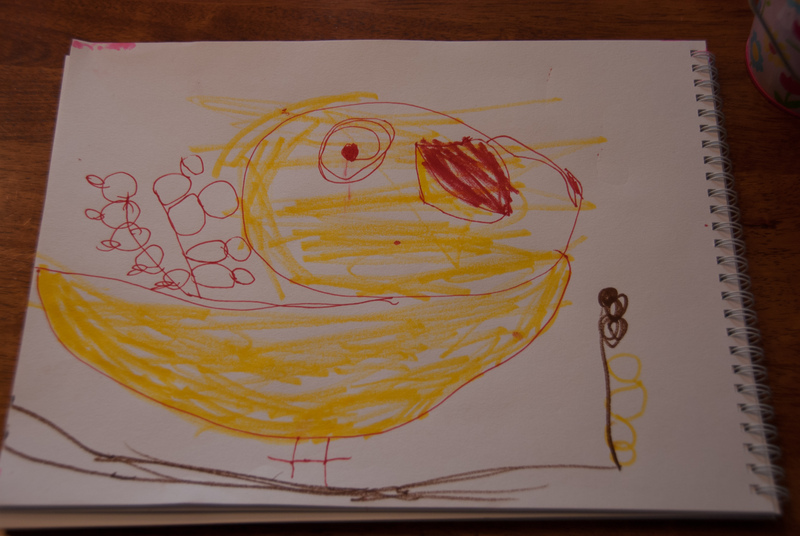 The lesson concluded with the guided drawing of a bird. Starting with a dot for the eye, descriptive directions using the elements of shape are given. Step by step illustrations are also provided. 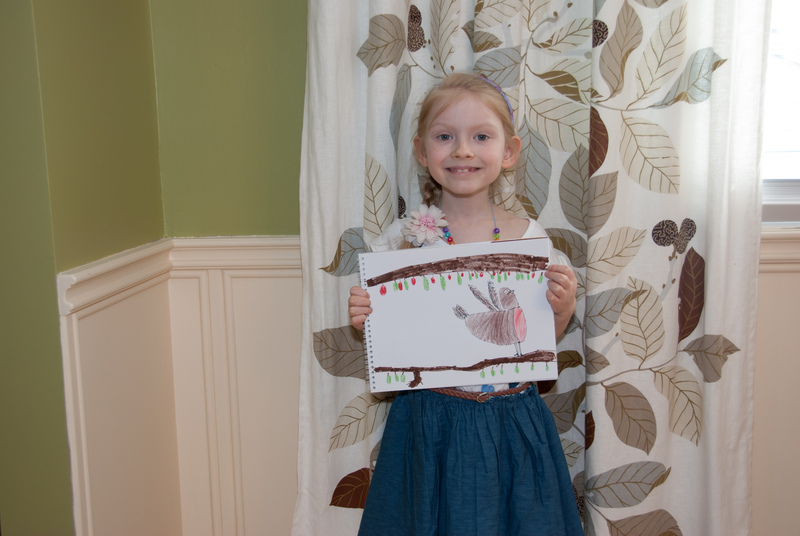 Big Sister was quite proud of her work, and since it is spring, she coloured it in like a robin. The lesson (and finished result) was so enjoyed, that we repeated it again a few days later, and Little Sister even decided to give it a try. And now it’s time for me to prepare for Lesson 2, as Big Sister has been asking for drawing lessons almost daily! 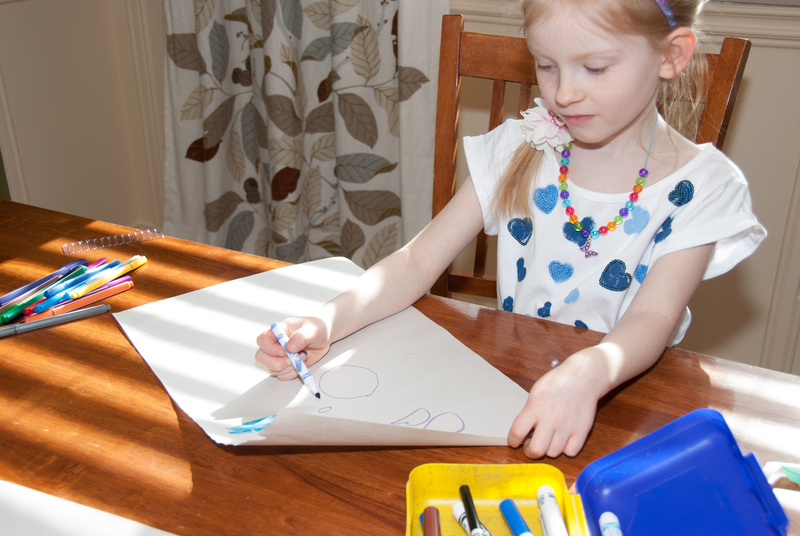 How do you teach art in your homeschool? Do you know of any great learn to draw programs suitable for beginners? I hear that from many who have the book, most don’t even start it they are just so overwhelmed or unsure how to implement it. I’m not very artsy either, but I’m intrigued by the idea that drawing is a learned skill and not necessarily an inherited gift. Your library probably has it Annette! And if not, there are tons of homeschoolers who have it sitting on their shelves unused, as we did! This looks cool. I haven’t done any art with my girls. I tried drawing lots as a kid and always wanted to be an artist, but by the time I was in my teens I realized my talents were in writing, not drawing. So I’ve been reluctant to try art with my girls, though I think they are much more talented than I ever was. 🙂 I might have to look into this. Thanks for sharing! Thanks for stopping by Bonnie! I have had zero experience with or even exposure to the arts in my life and find the hole thing quite overwhelming. We hadn’t done anything for art or artists study at all up until very recently, but I’m going to try to keep it a regular fixture of our homeschool from now on. My oldest is really loving it! Love this! We do a lot of art projects, but not a lot of learning how to draw, I am looking forward to doing more of that this spring! Thanks for sharing!